Denomination : AE-3. Mint : Nicomedia. Size : 17.4 x 19.1 mm. Weigh : 2.75 grams. Obverse : Head of Fausta right, with FLAV MAX FAVSTA AVG around. 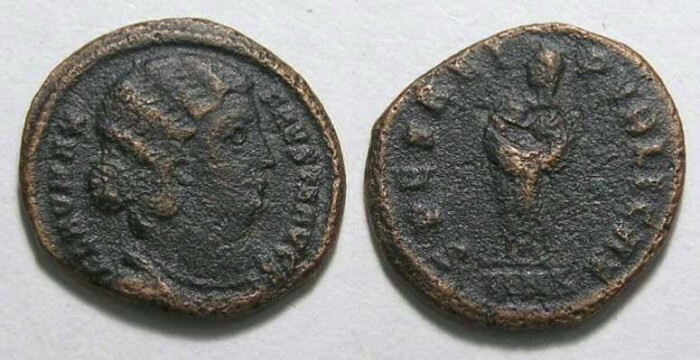 Reverse : Fausta standing forward with head left, holding her infant sons Constantine II and Constantius II, with SALVS REIPVBLICAE around. The mint mark at the bottom ends in NK for Nicomedia, but the letter before the N is not clear.